Shaw Floors, a flooring provider that started in 1946 as a carpet dye company, has expanded over the years to offer some of the highest quality residential and commercial flooring solutions available today; including various attractive collections of porcelain and ceramic tile floors. 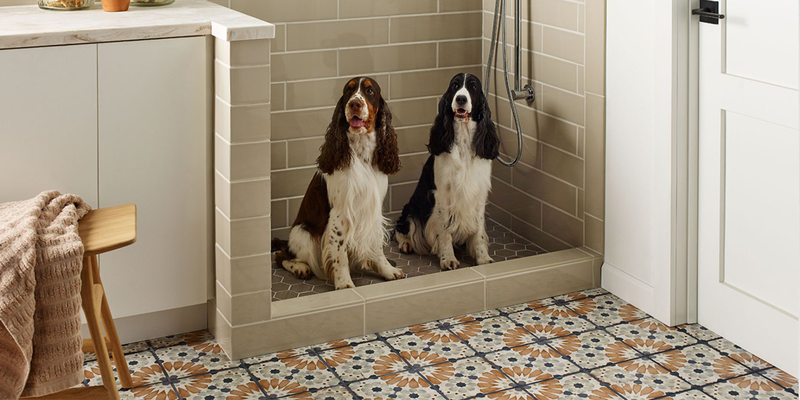 Shaw�s tile flooring collections are perfectly designed to accentuate any sort of decor style, whether it is modern or classical, a taste of elegancy and class are always provided to any surrounding. Whether you enjoy the look of porcelain, stone, or wood-look tile � Shaw has it all for the best prices. Shaw Flooring is an excellent solution for homes that need that touch of life to transform any dull living space into a jaw dropping masterpiece. One popular series is Shaw Channel Plank , a wood-look tile collection that brings charm and sophistication to any home, while still upholding a traditional feel. Perfect for areas such as: living rooms, dining rooms, and kitchens with wide open structures to really exemplify its grainy features. Shaw Hacienda, another porcelain collection that displays hardwood visual with unique and stunning mixtures of browns with an aged beauty. Shaw Glee, a stylish line of porcelain tile that brings striking visuals to fulfill modern design trends. With three colors to choose from, this chic and classy collection will provide you with everything you want and more. Shaw Valentino is another lovely wood look tile design that offers hand-scraped features - creating a very exquisite tile flooring options for houses with high ceilings and natural light exposure; especially in bedrooms, kitchens, and living rooms. Very sophisticated and very fashionable. To keep your porcelain tile floors by Shaw flooring clean and beautiful with that natural shine they had when you first purchased them � look through Shaw�s Hard Surface care and Maintenance guide for further instructions on how to easily maintain the look and feel of your floors. A 1-year warranty from the time you purchased your Shaw floors is also rewarded to residential areas. Refer to the maintenance guide above for a detailed description on warranties. Also, don�t hesitate to give us a call for the best possible prices on any Shaw tile flooring design for your future or present home renovation � 510.698.5142 � you will immediately be in touch with one of our flooring specialists, who will put you at ease when deciding what Shaw flooring collection to go with.